This post was sponsored by Green Sisterhood. All opinions are my own. Every holiday there are headlines about the toxic chemicals that can be found in children's toys. While some progress has been made in recent years, there are still plenty of materials to avoid. This situation presents many dilemmas for parents and gift-givers. You want to purchase an open-ended well-crafted toy for a child you love, but when you browse the toy sections online or at major retailers, you can't figure out if the manufacturer uses safe materials. Your mother-in-law is planning to buy a gift for her grandbaby, and you are worried she'll choose one you don't feel comfortable letting your baby play with and mouth. Your child received cash as a gift that she plans to spend on a toy, and you want to guide her towards a non-toxic, sustainably-made toy without being a micromanaging negative controlling-pants. What is the answer for all of these dilemmas? When you don't feel like spending hours researching the safety and sustainability of toys, a fabulous solution is to turn to a small trusted retailer that embraces the same values you do. For me, Wild Mint is just such a store. Founded by a mother and daughter in 2011, Wild Mint is dedicated to providing the best non-toxic and eco-friendly products to help you build a healthier lifestyle and environment. They offer green and natural toys made of only the safest materials. So when you want to gently nudge well-meaning friends and relatives towards non-toxic sustainable toys you would be happy to own, tell them about your new favorite online store Wild Mint. I have found that while some grandparents, uncles, and friends are happy to be given very specific gift suggestions, others really enjoy selecting a gift (and the price range of that gift) themselves. It's wonderful to be able to tell gift givers, "You know what my latest find is? The shop Wild Mint. They have so many well-made, fun toys for little ones all in one place!" And when your child wants the joy of selecting a shiny new toy all by herself using her holiday gift money without your thinly veiled objections to most everything she sees, let her choose any of the fabulous natural toys offered by Wild Mint. You'll both be happy! 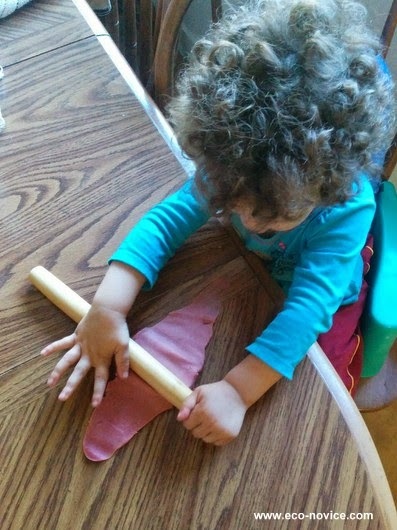 We recently had the chance to test drive one of Wild Mint's toy offerings: Eco-Dough by Eco-Kids. We've been given conventional play dough as gifts on many occasions, and I am always turned off by the weird synthetic fragrance and undisclosed ingredients. I love that Wild Mint offers an eco-friendly alternative! 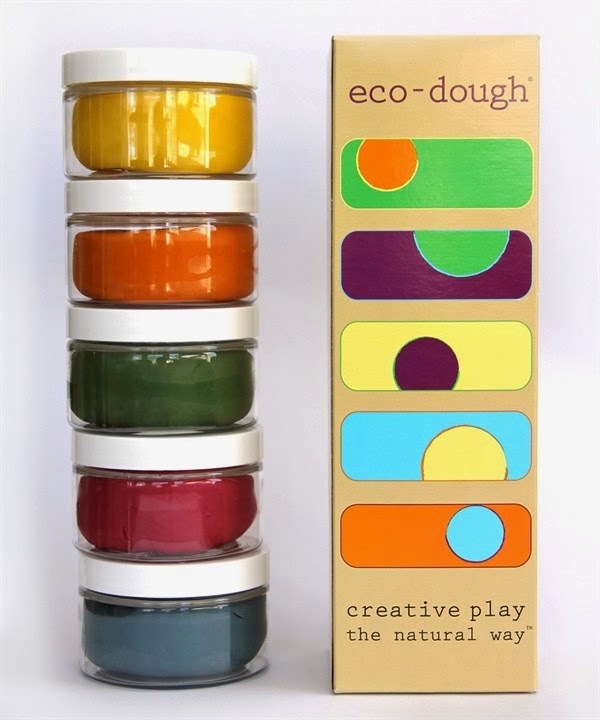 Eco-Dough is handmade in the US with natural and organic fruit, plant and vegetable extracts. Essential oils keep the dough soft and pliable and provide a light aroma. Five colors (4 ounces each) come in their own recycled PETE plastic container with screw-top lid. My kids love the vibrant colors! Play dough is a great toy for little and old kids alike. Our teenage babysitters love to mold objects with our 7, 5, and 3-year-old. This set would make a great gift for most any child over 2. Wild Mint offers many other eco-friendly arts & crafts materials in addition to play dough, including natural paints, finger paints, crayons and glue. Many potentially toxic chemicals can lurk in arts & crafts products intended for children. When you shop for arts & crafts supplies at Wild Mint, you enjoy the peace of mind that the materials are toxin-free! This holiday season, simplify toy shopping for you and your loved ones. Shop at Wild Mint! Enjoy $10 off orders over $75 with the coupon code WildMint (expires 12/3/14). 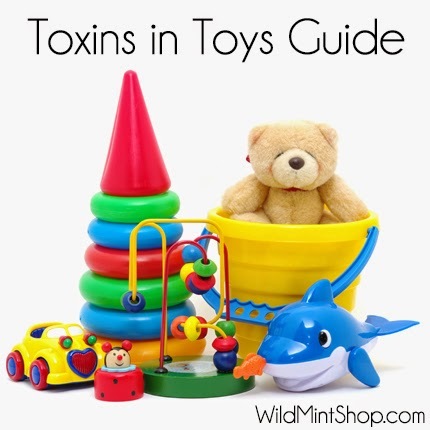 How do you avoid toxins in toys? My kids loved play dough when they were young. I wish they would had a more eco-friendly option when they were young. Buying from Wild Mint makes it easy to find great nontoxic products for the home. This store has a wonderful selection for just about everyone I can think of! I used to love playing with play dough when my kids had them. *Ahem. Don't judge. * They were probably very toxic too..groan. I'm so glad Wild Mint carries non-toxic ones now so kids of ALL ages can play with them. I've been a fan of Wild Mint Shop for quite some time- great products and they're a sponsor on my site!! They have so many non-toxic and sustainable products. I've purchased many of my kitchen accessories from them. I love that they're focusing on safe toys as well. Love the Eco-Dough! I love Wild Mint and all of their non-toxic toys. It makes me really miss the age when mine were still playing with all of those sweet things I recognize. Now I am really eyeing the glass food storage they have!